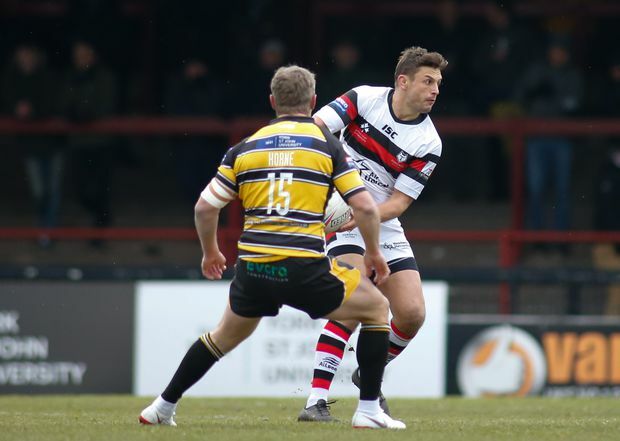 Toronto Wolfpack forward Jon Wilkin looks past York City Knights' Graeme Horne during the Betfred Championship Round 1 fixture at Bootham Crescent in York, U.K. on Feb. 3, 2019. Rugby league veteran and foodie, Jon Wilkin is looking forward to sampling what Toronto has to offer when the Wolfpack return home. The 35-year-old forward, a former England and Great Britain international, joined the transatlantic team last October after 16 years with St. Helens and one with Hull Kingston Rovers. He made his Wolfpack debut last weekend in a 14-0 win at York City Knights in Betfred Championship play. “It’s been awesome,” he said of his time with the team to date. “I’ve done the same thing for 17 years ... So something new and something different was going to be just exciting for me. It’s been a real change. Toronto plays Sunday at Rochdale Hornets, which had a bye last week. Wilkin is an entrepreneur as well as an athlete. Off the field, he serves as a TV pundit and restaurateur. He has two coffee/brunch spots in central Manchester named Pot Kettle Black, with two more slated to open next October and January. He talks rugby league for the BBC and, recently, Sky Sports — something he calls a hobby. He will be casting his restaurateur’s eye on Toronto when the Wolfpack opens the home half of their schedule April 28. He will have company in wife Francesca Wilkin (nee Halsall), a former Olympic swimmer who retired in January 2017. “She’s bringing her credit card and she’s already in the process of booking restaurants as we speak,” he said cheerfully. Wilkin says his wife’s athletic career gives her an edge over him when it comes to dining. “She’s used to eating a lot of food. Those guys consume a lot of calories,” he said wistfully. Halsall, a sprint freestyle specialist, competed in the 2008, ‘12 and ‘16 Olympics. She finished just 0.02 seconds off the podium in the 50-metre freestyle in Rio. Halsall won three gold and seven silver medals at the Commonwealth Games. Her medal haul also includes gold in the 4x100 medley relay team at the 2015 World Championships and the 50-metre backstroke at the 2016 European Championships. Wilkin also has an impressive trophy case. He won two Grand Finals, four Challenge Cups and a World Club Challenge while scoring 94 tries in 424 appearances for St. Helens. “An outstanding fellow as well. An outstanding leader,” said Wolfpack director of rugby Brian Noble, a rugby league legend in his own right. Wilkin credits his restaurant experience for adding to those leadership skills. Wilkin, who has never been to Canada, had other offers from big clubs but said he heard nothing but “amazing things” about Toronto. He is no stranger to the Wolfpack roster, having played at St. Helens with Gary Wheeler and Andrew Dixon and against the likes of Ashton Sims, Bob Beswick and several others. Off the field, Wilkin campaigned long for a players’ union. He has also served as a U.K. Anti-Doping team sports ambassador.